Wherever you go in Georgia, you can be sure to eat khachapuri at least once a day. These national cheese breads come in various shapes. 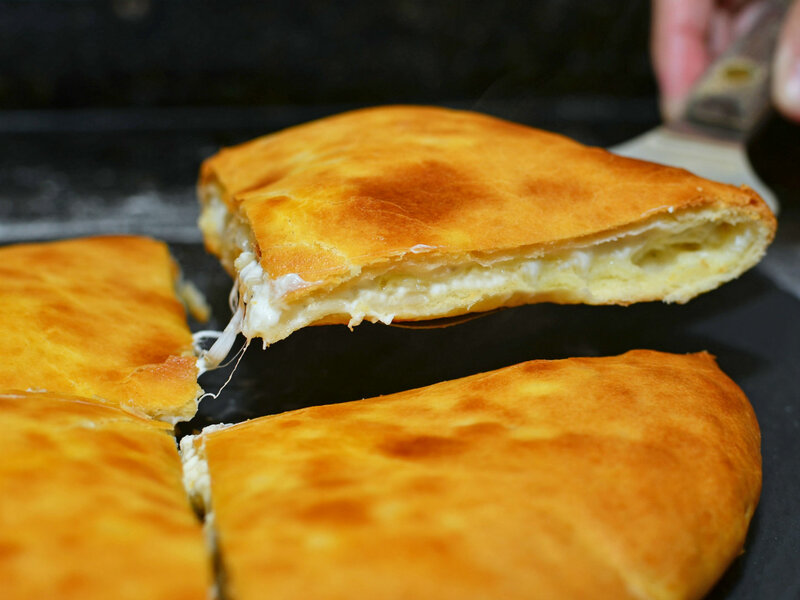 The Imeretian khachapuri is a round pie filled with cheese and by far the most common. If you like excess, try the Mingrelian version, which is similar, but topped with even more cheese. Traditionally the cheese is homemade and the dough made with yeast, but this recipe can be prepared quickly using baking powder and cheese from the market. The mixture of mozzarella and feta is commonly used outside of Georgia. With a little bit of practice, you can have a delicious cheese bread made from scratch in about an hour! The national day of Georgia is on May 26th and as a foodie you should of course celebrate by making this recipe for the national dish of Georgia! Place the yoghurt and egg in the bowl of an electric mixer fit with the paddle attachment. Add about 2/3 of the flour with the salt and baking powder, and mix on medium speed until homogeneous. Preheat oven to 225°C (437°F), and place a dish full of water on the bottom rack. Slice the mozzarella and feta. In a bowl, crumble both cheeses between your fingers. Season with black pepper, and adjust the salt level if necessary — the mixture should taste quite salty, but still be edible! On a floured surface, roll each ball of dough into a 20 cm large disc (it is not necessary to make a perfect round shape). Place the cheese mixture in the center, then wrap the dough around it, like you would wrap something in a handkerchief. Flip the dough over, and gently roll each khachapuri back into a 20 cm large disc. Transfer the khachapuri to a baking sheet lined with a parchment paper. Brush the dough with a mix of egg yolk. Bake in the oven for 18-20 minutes, until the top is golden brown. Let cool 5 minutes, then slice and serve. Are ju sure you had it in 225°C (Celsius) (equal to 437°F)? Dough should not be white and tacky after 20 min in 225°C. thank you for this recipe, my late mum who was born in soviet union (Russia) lived in soviet Georgia for a time when she was young and of course, the food stuck with her. Later she would make hachapuri from time to time. Just made this and it turned out great. The dough is great, just like it was made by my mum. I could tell when mixing the dough, it is the same smell. Thanks.